Adjusted total debt is the fair value of a company’s total short-term, long-term, and off-balance sheet debt. We use the fair value of a company’s total debt in our models because as it is a better representation of a company’s current and future obligations than the book value reported on the balance sheet. The fair value of a company’s total debt is the current amount the company would need to pay to retire the debt and settle the claims of the creditors. This fair value of debt is subtracted from shareholder value because the firm would need to settle these claims before it could return any cash to shareholders. AT&T (T) is a good example of a company with more debt than can be found on the balance sheet. As of its last fiscal year end, AT&T had an adjusted total debt of $101 billion. Their balance sheet only shows $72 billion of debt, for which the fair value was disclosed as $84 billion in the financial footnotes. We add $19 billion in operating lease obligations to arrive at a far more accurate $101 billion liability for total adjusted debt. Without careful research, investors would never know about off-balance sheet operating leases and fair value disclosures hidden in the footnotes. These adjustments to reported debt are critical to understanding the future cash flows available to shareholders. Figure 1 shows the five companies with the largest adjusted total debt removed from shareholder value in 2012 and the five companies with the largest adjusted total debt as a percent of market cap. 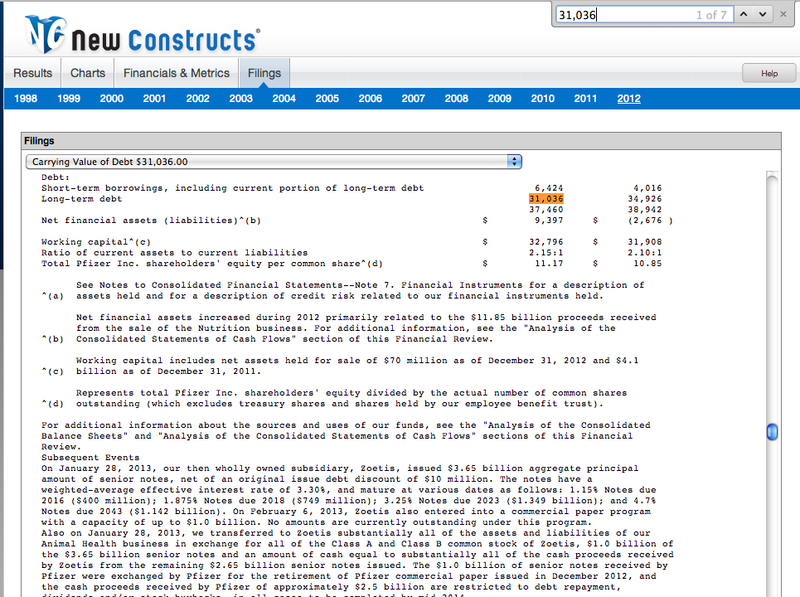 Sources: New Constructs, LLC and company filings. Stocks with market caps under $100 million are excluded. However, these companies are far from the only companies that are affected by adjusted total debt. 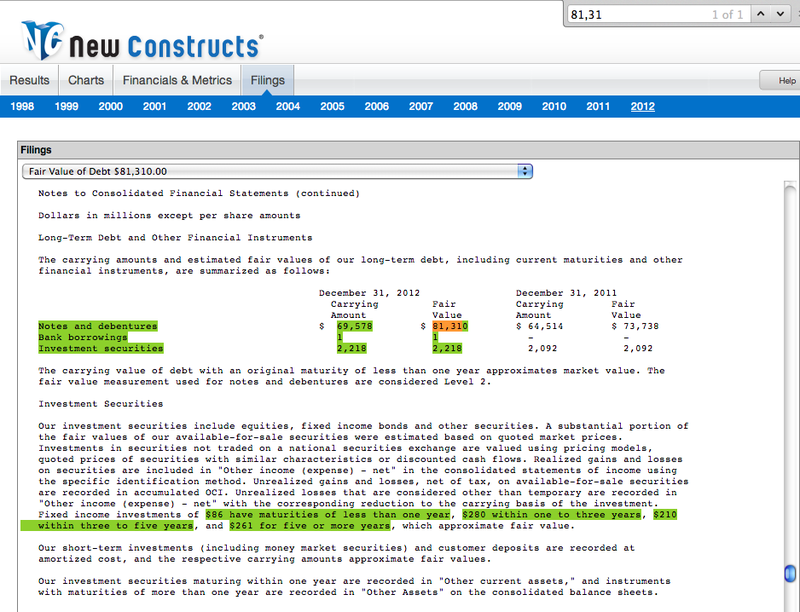 In 2012 alone, we found 2631 companies with adjusted total debt removed from shareholder value for a total adjustment value of over $4 trillion. Since adjusted total debt decreases the amount of cash available to be returned to shareholders, companies with significant adjusted total debt will have a meaningfully lower economic book value when this adjustment is applied. For example, Pfizer (PFE) had a total of $45 billion in adjusted total debt removed from shareholder value. This includes its $31 billion fair value of long-term debt, $6 billion in fair value short-term debt, and its $1 billion in off-balance sheet debt. Without making this adjustment, PFE’s economic book value would have been $260 billion as opposed to its adjusted value of $215 billion, and its economic book value per share would have been $36/share instead of its current $30/share. Investors who ignore adjusted total debt are not getting a true picture of the cash available to be returned to shareholders. By adjusting total debt, one can better understand the value of the stock to shareholders. Diligence pays.